LYNNE, WEST & EAST SIDES were divided by today’s Washington Blvd. : In 1855 Lynne East had only one block in the Lemon Survey, and only 3 farms were claimed there; 42 farms were claimed on the west side. The land that was later named the east side of Lynne got off to a slow start in the 1850s partly because it lacked water. By 1855 there were 42 claims for farms on the west side and only 3 on the east side. In about 1867 Rasmus Christofferson settled on the east side of Lynne, and in 1868 he supervised the building of the Christofferson Ditch,(aka Upper Lynne Ditch) running along the bench, opening up the land on the east side of Lynne for farms and houses. Frederick A. Miller and George Smuin were also early settlers in the late 1860s on the east side of Lynne. 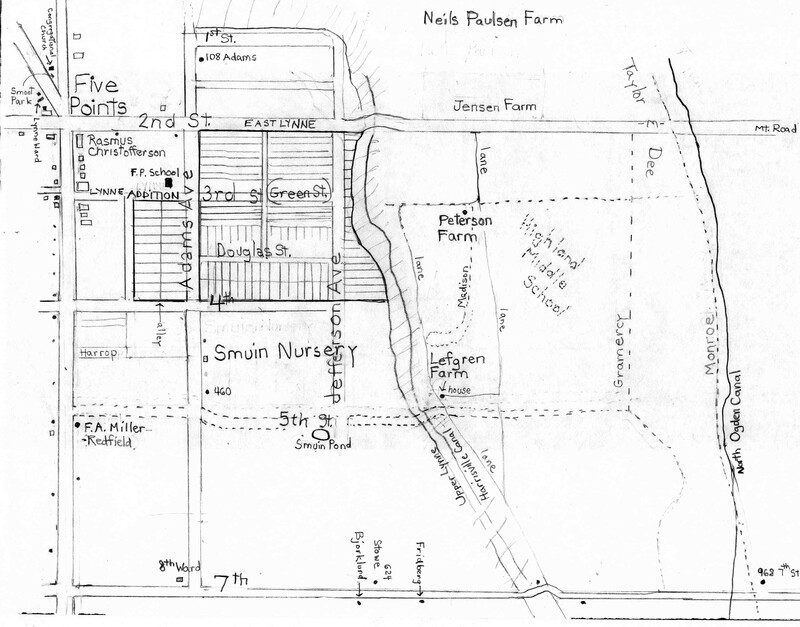 Like Rasmus Christofferson they were farmers, but George Smuin managed his farm in a slightly different way. He started a farming business of strawberry fields, orchards and the first hot house in Ogden, and he hired employees. His business was called G. Smuin & Co. of Lynne Nurseries. 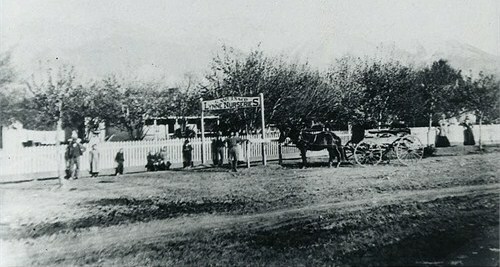 G. Smuin & Co. of Lynne Nurseries; photo c. 1885. George’s entrepreneurial spirit expanded the business very quickly. As George employed immigrants from Scandivania in his orchards and strawberry fields, they also began to build houses on the east side of Lynne community, clustering where others of the same nationality lived so they could share their native language and customs. Rasmus Christofferson was from Denmark and his language skills helped many new Danish settlers who worked for George. In fact he made a great effort to help all Scandinavian people who settled in Lynne, and he served for awhile as president of the Scandinavian Society. In 1891 George Smuin was made bishop of the Lynne Ward with Rasmus Christofferson and Walter Crane as counselors (Walter Crane lived on the west side of Lynne). In this call they assisted the poor and the needy and continued as special benefactors to the Scandinavian immigrants. The Scandinavian people were so appreciative of their help that they surprised George Smuin and Rasmus Christofferson with special gifts in gratitude of their selfless service, trust, and friendship. In 1889 Ogden City annexed Lynne Precinct, the fastest growing district in Ogden. Businesses were springing up at Five Points and land values escalating. Two subdivisions were surveyed between Adams and the irrigation canals on the hill; they were named East Lynne and Lynne Addition (see map below). In 1890 Ogden established free public schools, dramatically increasing the enrollment. The 1877 Lynne School at 198 W. 2nd Street was now too small to accomodate the new student body of the rapidly growing Lynne Community. Rasmus Christofferson donated the land on the NW corner of Adams and 3rd for a new school, The Five Points School, and the school building moved from the west side to the east side of Lynne. 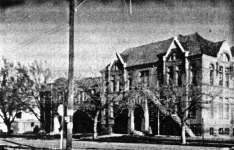 Five Points School on corner of 3rd and Adams cost $16, 770 in 1892. In 1892 a special census was taken of the Lynne Precinct; there were 931 souls altogether. Lynne East was a fast growing area in the precinct, and by 1908 the Lynne Ward was large enough to divide. The Mormons west of Washington Blvd remained as the Lynne Ward, and the Mormons east side of Washington Blvd. were put in the newly formed Ogden 8th Ward. After serving for 17 years, Bishop Smuin and Rasmus Christofferson were honorably released. Rasmus Christofferson died in 1910 at the age of 72, and George Smuin died in 1913 at the age of 68. LYNNE EAST SIDE, c. 1900: the unsettled parts of the 1851 Lemon Survey are a busy part of the community in 1900. Lillian Christofferson Linton, Biography of Rasmus Erastus Christofferson, Original Pioneer 1861, manuscript, p.4; Lynne Irrigation Co.’s Minutes, 1880-1895, p. 102,103. Grant Lefgren, A History of the Smuin Family, manuscript, 2013. Ibid; Lillian Christofferson Linton, Biography of Rasmus Erastus Christofferson, Original Pioneer 1861,p.4. Lillian Christofferson Linton, Biography of Rasmus Erastus Christofferson, Original Pioneer 1861, p.5. Standard Examiner, J.A. Stephens, REAL ESTATE BROKER, Oct. 9, 1889. Lillian Christofferson Linton, Biography of Rasmus Erastus Christofferson, Original Pioneer 1861, p.4. Andrew Jensen, History of the Lynne Ward, manuscript, introduction & p.12.